Even high in the Swiss Alps, the air is thick with uncertainty. Political and business elites are leaving their annual gathering in Davos with major worries about the future. Four days of discussions at the World Economic Forum have provided little clarity on what to expect in 2017. Many are nervous about the unpredictability of a Donald Trump presidency, and how China and Russia will respond to the new man in the Oval Office. In Europe, worries surround Britain's exit from the European Union and a looming series of national elections. Trump takes the oath of office on Friday, but there are still big questions about the wealthy real estate developer's policy agenda. Many key positions in his administration remain vacant. What Trump has said suggests he will reshape the U.S.'s relationship with allies and foes alike. He has pledged to put America's interests first and threatened to slap the country's biggest trading partners with punishing tariffs. "Some of that rhetoric related to the trade adjustment ... I hope that is not the policy. That policy attacks the voters that voted for him," said Larry Fink, CEO of investment manager BlackRock. Some business leaders in Davos have welcomed what they see as Trump's pro-businesses orientation. That view has been reflected in rising stock prices and a sharp uptick in consumer confidence. Others are worried about policy uncertainty and the possibility that Trump's policies could backfire. "Uncertainty is at a peak, and actually uncertainty is the enemy of long-term investment," said George Soros, the billionaire investor and chairman of Soros Fund Management. "I don't think the markets are going to do very well. Right now they're still celebrating. But when reality comes, it will prevail." China has positioned itself to play a much more significant role on the global stage. Chinese President Xi Jinping, in his first appearance in Davos, pledged to promote globalization even as Western countries led by the U.S. flirt with protectionism. 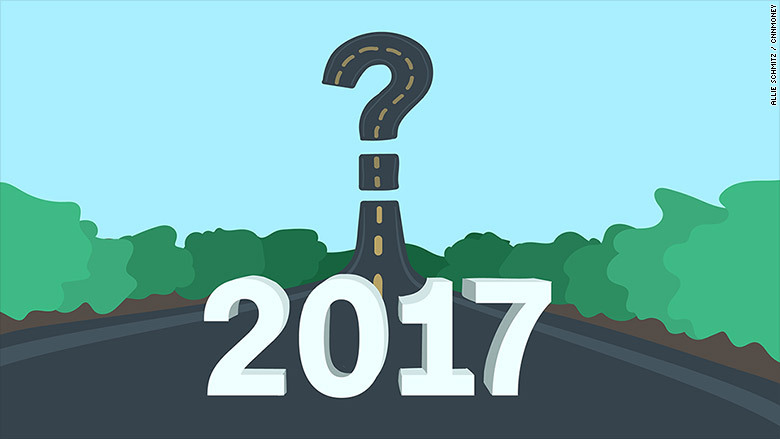 But Beijing also faces an uncertain 2017. Trump angered Chinese leaders even before taking office by questioning the country's activities in the South China Sea, as well as its treasured "One China" policy. Both issues are of paramount importance to China, and they promise to be a major focus as the ruling Communist Party prepares for its national congress in the fall. Ian Bremmer, president of risk consultancy Eurasia Group, said the uncertain geopolitical environment, coupled with the potential for conflict with the U.S. and domestic political concerns, will leave Beijing in a worried state. "These are things that really unnerve the Chinese," Bremmer said. The British government made clear this week it wants a complete break with the EU. That means a lot of uncertainty for businesses based in, and trading with the U.K.
Banks and other financial institutions have already started planning to move thousands of jobs to other European countries in order to be able to continue doing their business across the EU. Prime Minister Theresa May said she hopes to negotiate both the U.K.'s departure and a new trading relationship with the EU within two years. Experts say that plan may be too ambitious because negotiating complex trade deals usually takes much longer. May will need to finalize the separation settlement within two years or risk crashing out of the EU with no deal at all. Russia is sensing an opportunity to improve its relationship with the U.S. with Trump in the White House. The Russian economy is set to return to growth this year, and it may get additional boost from higher oil prices. But President Vladimir Putin faces an election in 2018, and could be looking to flex his muscles for the benefit of a domestic audience. "It will be a complex year, we have to ensure growth... and work in such a way that a majority of people who will go to the presidential election will agree with us," Russia's first deputy prime minister Igor Shuvalov said in Davos. "In terms of the global scene, we think it's going to be warmer to Russia," he said. Outgoing U.S. Vice President Joe Biden used his speech at Davos to warn of Russian efforts to dissolve the community of democracies, using every tool available to it. He said that Moscow will attempt to undermine elections in Europe. "The purpose is clear: to collapse the liberal international order," he said. France, Germany and the Netherlands -- three key EU members -- will hold elections this year. In each, there is a chance the establishment parties could lose ground. 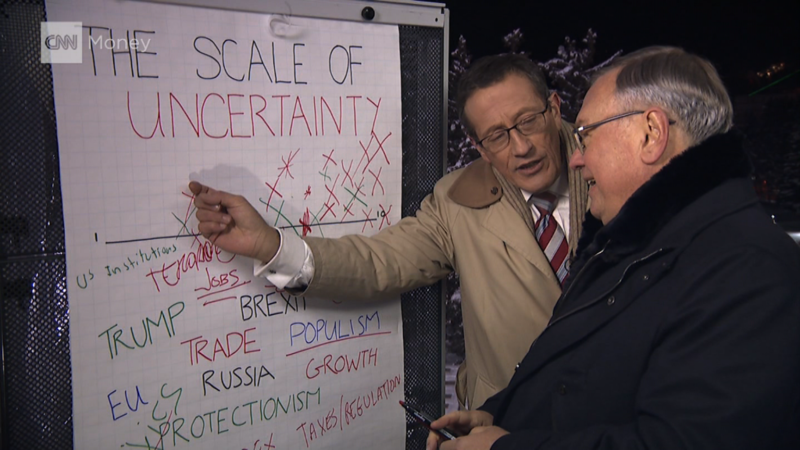 'There is a lot of uncertainty, we don't really know what will be the geopolitical risk. We don't know what will happen to trade," said German finance minister Wolfgang Schaeuble. With anti-European populism on the rise, the future of the European project and the willingness to engage in international cooperation is more than uncertain. "Populism is the most important risk... we will see more protectionism, and perhaps reversal of trade agreements," said Ray Dalio, founder and chairman of hedge fund Bridgewater Associates. "We might be at the point where globalism is ending... there is a significant risk of it," he added.